There is a perfectly simple explanation to the question of why togas are some of the best Halloween costumes or just plain old party attire. Our ancient Roman ancestors had the right idea when they decided to start the tradition of wearing togas to formal events or parties. They are the most comfortable, stylish, and trendiest form of party garb, and they are so easy! Toga! Toga! 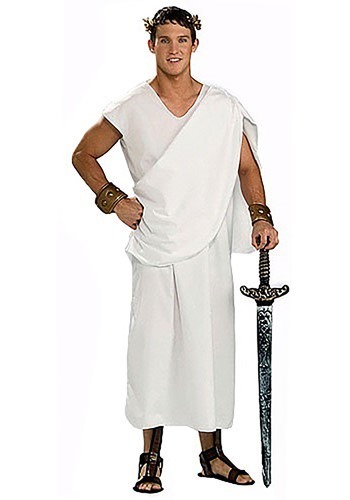 This Men's Toga Costume is a great ancient warrior costume. Add a sword and a shield to really look vicious or wear this to a party and just have a red Solo cup as an accessory! You are sure to rival even the greatest demigods, such as Hercules or Bacchus. In addition to the solo cup, add a pair of lace up sandals, a laurel wreath, and also make sure to carry a few extra denarii for a cab! Rome may be known for their glorious baths, but there fashion sense is almost as unrivaled. This costume is a sleeveless pullover robe has V-neckline, so you don’t have to deal with the hassle of tying a real toga – trust us, it is a real pain in the podux! The sash is draped over the shoulder and sewn, keeping your toga perfectly placed all night, with little risk of it accidentally coming unraveled. You don’t want to show off your Lupa themed underwear now do you? This costume is made from a 100% polyester interlock knit fabric, keeping you clean and dry throughout the night’s adventures.